Let’s bust some myths, shall we? We’ve aggregated a year’s worth of data on some entertainment brands to let the data tell the story. Of course, results vary by industry, technique, timeframe, and geography, but the main principles hold true. So let’s look at negative feedback as one measure of “irritation”, though you could certainly examine sentiment and newsfeed reach. Some pages post 30-40 times per day and actually get less negative feedback as a proportion of total engagement. And their total negative feedback is shrinking, too, which helps organic reach. This is despite these pages doubling in user bases over the last year. The fact that Facebook has made the newsfeed algorithm smarter hurts the spammers, while helping the good guys (which I’m assuming includes you). In other words, Facebook is less likely to show your content to people who won’t enjoy it, so they’re doing you a favor by whittling down to the right reach. If you’re self-promotional, then you get whittled down to almost nothing in today’s newsfeed reach. Hence, the complaints about reach decline, blaming Facebook as a purely paid mechanism, and so forth. If your negative feedback is greater than one per 100 interactions (download your CSV insights file to measure this), then something is wrong. The top brands are down at 0.3 negative feedback per 100 interactions and declining. The enemy is not the Facebook algorithm — it might actually be you polluting newsfeed with promotional content. It would seem to make sense that you wouldn’t want to inundate your fans, right? The reality is that there is so much content out there that usually single digit percentages of fans are seeing your content anyway. That’s not a license to post more frequently to counteract reach decline — the equivalent of yelling louder. But it is trusting that if you have worthy content, Facebook is getting smarter about delivering it to the right people. You’d expect this and maybe assume that your reach and engagement per post declines correspondingly. However, if your content is solid enough, doubling post frequency gives you nearly double the engagement. Post as often as you like, even 10 times per day, so long as you have excellent content. But if you don’t have great content, don’t feel compelled to post something, any more than you would eat another plate at the buffet just because. Check your negative feedback to see if you may be inadvertently over-promoting, instead of engaging users. 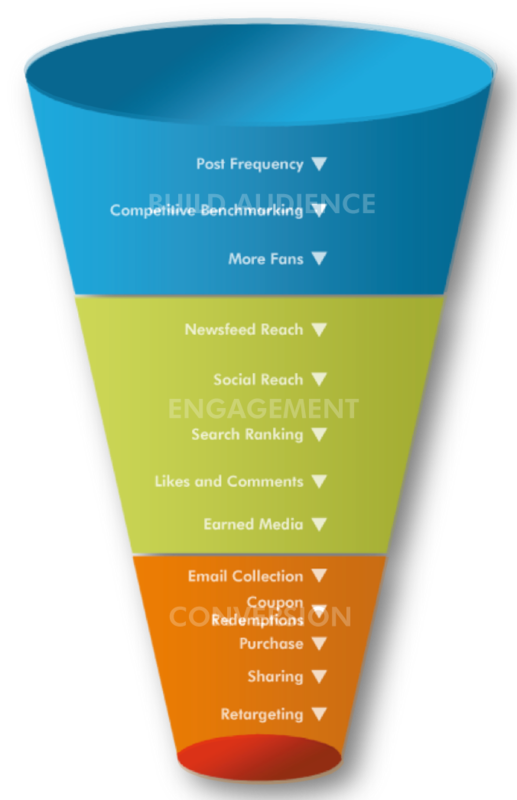 Are you practicing the AEC funnel to make sure you have a balanced content strategy? Benchmark yourself against similar brands/companies. While you might not have access to their insights data, you can certainly look at their PTAT divided by their fan base, how much you overlap with their fans, and how often they post. Not to say that you should take competitors’ actions as a proxy for good performance. But you should measure it, if for no other reason than to benchmark for your boss.